I’m really not a fan of short stories. I guess I’m just not intellectual enough to understand things that are brief and vague. I need things spelled out for me in novel length. However, the short stories in “Swim Back to Me” by Ann Packer were well-written tales of loss and heartbreak, and the day-to-day grief of life. I know. Pretty depressing. And I’ve been consciously avoiding depressing books lately. But Packer writes emotion VERY well and it was easy to get lost in her tales. As I always do, I found myself wishing each story was a full-length novel. Oh, well. Can’t have everything. And the first and last stories tie back together, which was interesting, but decidedly infuriating in its ending. 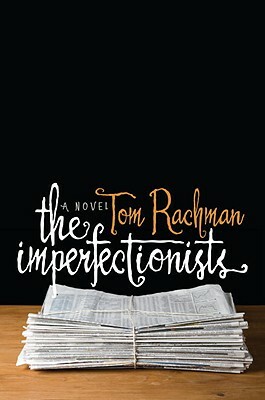 In “The Imperfectionists” by Tom Rachman, American reporters, editors and employees at an international newspaper based in Rome struggle to keep their lives, and the paper, afloat. Each chapter highlights a different character and Rachman is excellent at creating in-depth characters in very few pages. Interwoven between the chapters is the history of the paper and its founders. It took probably three or four stories to get into the book, but then I was hooked. I even forced Tom to read it. (I’m sure he’s very grateful.) Characters appear in each other’s stories and it’s fun to get different perspectives of each person. These stories will make you wonder what makes your fellow employees tick or what’s going on in their minds during their workdays. Thanks for an interesting book, I’ll try in the next 10 days.